Communication junior Sarah Mowaswes performs at Comedy Empire Friday in Harris Hall. Mowaswes’ set focused on her family and taking a quarter off. 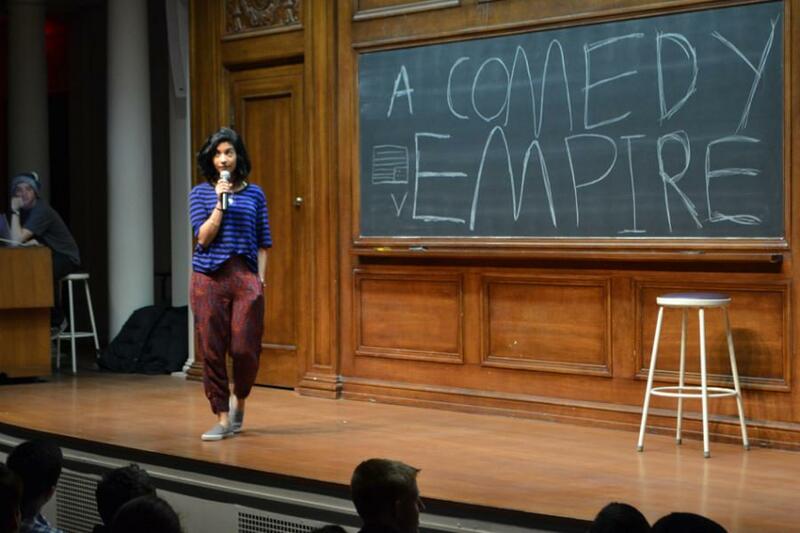 More than 100 people filled Harris Hall on Friday night to share some laughs with student stand-up comedians in a free event held by Northwestern’s Comedy Forum. Communication junior Sarah Mowaswes was the only female comedian out of seven to perform in the event, titled Comedy Empire. In her routine, she discussed spending Fall Quarter at home as well as marriage, her family and having kids. “There’s not a medical reason for me being a lazy piece of s— at home,” Mowaswes said on stage about her time off from school. “I sincerely cannot wait to trick someone into being my best friend,” she added about getting married. Comedy Forum, NU’s only stand-up comedy group, usually puts on two shows each quarter. The group has workshops every Sunday that are open to all students. Any students that tell jokes at the workshops and perform stand-up off campus are eligible to perform, president Charlie Gingold said. Mowaswes has performed with Comedy Forum in shows for the last two years and said she likes the warm and open atmosphere, and how she can use her sets to make light of heavier things. “I like to talk about my life and stuff that happens in it because it’s really easy to take some that you’re like, ‘That was the worst thing ever,’ but make a joke about it and be like, ‘Oh, it’s not so bad,” Mowaswes told The Daily. Communication sophomore Sam Saulsbury was the host of Comedy Empire, having previously performed as one of the featured comedians. Comedy Forum has had more members than ever this year, Gingold said. The group collaborated with others in a show early in this academic year and had enough comedians to put on two more shows Fall Quarter. Shows, like Comedy Empire, are occasionally free to give back to audiences and encourage people to come. “I did material that I thought people were going to get amped about, and then for the rest of the night, when people had sets that were going good I would keep it going and be like, let’s move on to the next comedian,” Saulsbury said.